February 18th 2015. 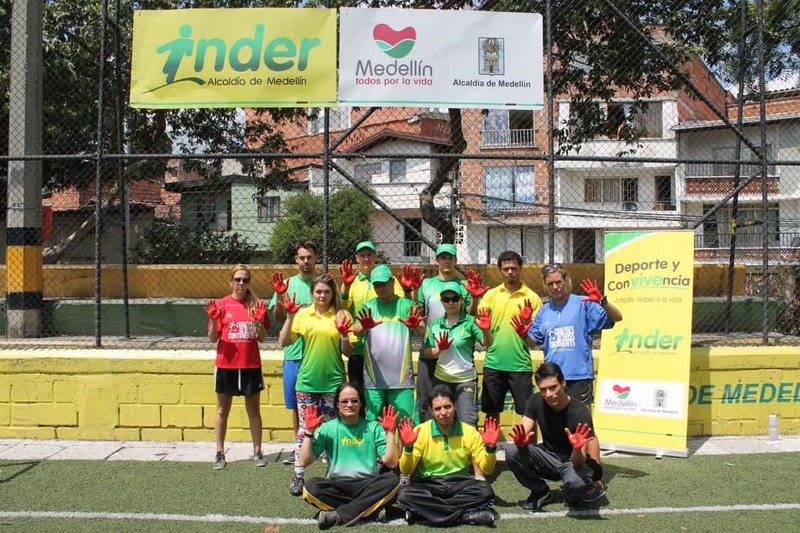 SDL Coach, Nora Dooley, writes about our first ever training in Medellín, Colombia with Grupo Internacional de Paz. A day for recognizing love, widely celebrated in the States, Valentine’s Day lands just two days after another day, little known in the US, but on calendars across the globe. Rather than red hearts, this one is a day for red hands; the International Day Against the Use of Child Soldiers, Red Hand Day. Our team would spend this day in Medellín, Colombia, for the first of two programs this year with new partners, Grupo Internacional de Paz (GIP). This first program was one, very full day with an advanced group of coaches from Inder Alcaldia de Medellin, the sports institute of Medellín. We knew this would be a fun day when our Circulo de Amigos (Circle of Friends) kicked off with myself being taught a new version of salsa by one of the participants. Laughs filled the day, but this was also a group we knew we could engage on some serious issues plaguing the community. We learned this about them early on after a classic game of Mingle Mingle raised a debate about culture and tradition. The participants remarked how Colombia’s culture is more aggressive, and so the pushing and pulling occurring during the game is not as serious – there is a cultural understanding. This was a highly educated group of people and once they realized what they were saying, the debate quickly transitioned to discussing the need to redefine these cultural norms. That conversation, born from a teachable moment, set the pace for the rest of this action-packed day with CAC. 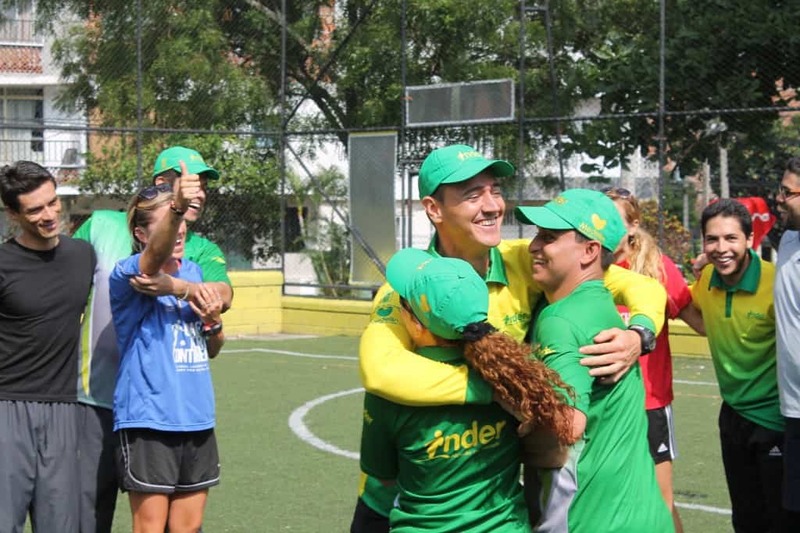 This group of participants comprised of Inder coaches and leaders, karate masters and roller-bladers, as well as a FIFA referee who was in Brazil last summer, was well-versed in sport for social impact. It was clear that our organizational and developmental values were mutual, and this platform turned into an amazing setting for us all to learn from each other. One of the games I was especially excited about is part of our Child Rights curriculum. It is originally a game used to address the issues of child trafficking in the countries and communities where that is a grim reality. Here, however, we adapted the game just slightly to cover the issues surrounding the recruitment of child soldiers in Colombia. In this game there are four squares, one in each corner of a space (size is relative to the group). Each square represents a different reason children are recruited, and the participants come up with these prior to kickoff. This group asserted tasks such as prostitution, the use of children on the front-lines as deterrents, using children to carry drugs, and turning them into thieves for the cause. Then we needed volunteers to represent the various tactics the adults from the paramilitary forces and the guerilla rebel groups use to recruit children. This group was smaller so we only had two to start. The examples these participants thought of included tricking children with sweets, money, kidnapping them, threatening their families, and offering false promises. Then we started the game. When the ‘adults’ chase and catch a ‘child’ they bring them into one of the four spaces and they have to stay there. Once all the ‘children’ are ‘recruited’ for the various tasks, we stop and add a new rule. Then we play another variation, and this time with some positive elements. We ask the coaches what the suffering communities can do to prevent the different forms of recruitment and what they can teach the children to empower them to help themselves. These coaches brought up many different solutions such as safe spaces like sports, school, organizations and youth clubs, as well as spreading information, communicating, and sharing knowledge and ideas. In this next version we introduce 2-3 cones spread out around the pitch to represent safe spaces. We also introduce a moving ball that represents this positive communication. If a player has the ball (at their feet) or is standing at a cone they are safe – but they can only stand at a cone for 5 seconds and they have to share the ball! What a great way to honor all the unnecessary deaths of child soldiers all over the world – a day spent with people whose key purpose is to use sport to engage children and prevent such atrocities. On this day we not only fight to help in the prevention of child soldiers in Colombia but in all the countries where we have seen the effects of this senseless tradition. We remember our friends in northern Uganda, Sierra Leona, and Liberia, places where we have worked to help reintegrate former child soldiers into society using that ever-powerful, ever-beautiful game. It would not have been easy to run a one-day training with many groups, but these coaches from Inder were phenomenal, and we were able to hit the ground laughing and learning. We hope there is more in the future for our two organizations, and we know there is more for CAC and GIP. Stay tuned to read about how we spent Valentine’s Day in Apartadó – beautiful banana farm country, but an area severely affected by FARC activity and the exploitation of child soldiers.